Another darling dress for your darling toddler. Sized for 18 months, 2T, and 4T. Super - easy, with simple stripes and stitch patterning. 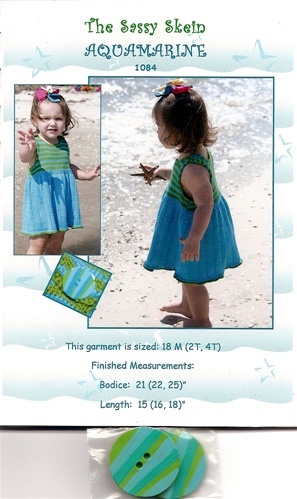 Super 10 mercerized cotton is the perfect yarn, and the buttons and an instructional DVD comes with the pattern! This dress can be used year round with a blouse or turtleneck and tights. If you want us to make you up a kit for this pattern, please email us. 3 skeins of Super 10, any size.